Thank you for joining me as we count down to the next MFT release. We are three days away from the big day! All the new Stamps, Die-namics, and Stencils will be available on Tuesday, November 3 at 10:00 pm EST. Be sure to check out the MFT Blog to see all the new items being revealed today. Don't forget to leave a comment on the MFT Blog countdown posts, YOU could win one of the five $75.00 gift vouchers. I have a couple of sweet cards to share with you today, they both feature the new Let's Get Cozy stamp set and Diagonal Quilt Square Cover-Up Die-namics. 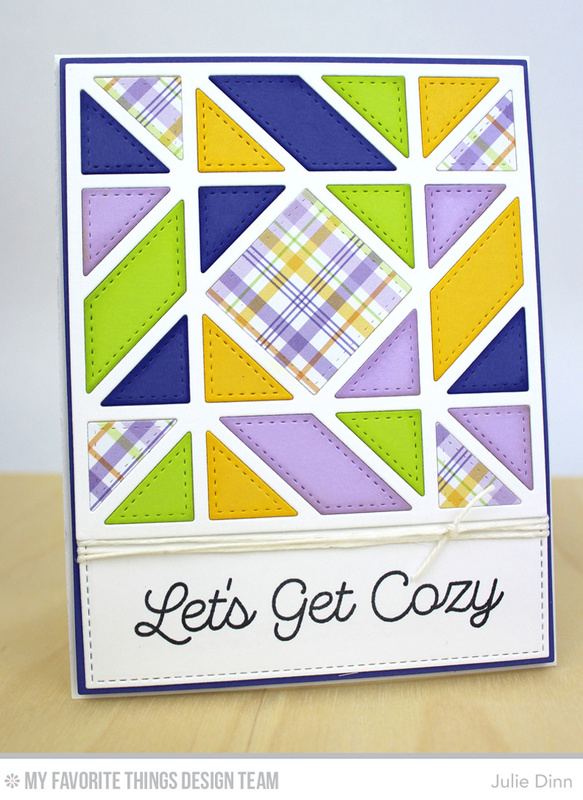 I pulled the color combination for both of these cards from prints in the Plaid Patterns Paper Pack. both cards are really amazing! Wow, another great use of this die. I adore the colors of both cards and love the sentiment on the first! Great plaid paper to make quilts with- takes care of matching solids! Beautiful quilts. Love these plaid papers perfect for quilt creations! Love your colors on both cards. So pretty! I love the beautiful and bright colors that you used for the quilt!! It looks very warm and cozy!! Amazing card! !